Our terms and conditions are fairly basic business. Normally, T&C's are pretty dry sterile small print laid out in leagalise. We've tried to make ours informative and a fairly easy read. We will provide you with the product you order to the absolute best of our ability. We will always be up-front and honest with our customers, will discuss details of production if that is what you wish and will always try to be friendly nice people on the end of the phone because that is what we are about - customer service is our driving force. We expect to be paid promptly and in full for the work we do, but will accept a customers word if there are problems with a job such as breakages (see below). We aren't a faceless corporation but a hardworking small business - so you get a personal service from the people who make the mugs, do the accounts, design the artwork and generally run the business. As we said, we expect to be paid for the work we do and although we state our payment terms as being either pro-forma or a maximum of 14 days on an issued invoice, we do make allowances when business have, for example, certain days of a month for cheque runs. Once we have got to know a customer our accounts lady is happy to give a little leeway. But very occasionally we have to chase payment. We do so by three methods. The first is to drop the customer a line either by email or post, sometimes both, to remind the customer that payment is overdue. We'll even do it a second time. If there is no response, we may have to revert to the small claims court - which is really the last resort as this is both time consuming and expensive for the customer as the Courts add on their own costs and often interest for the time the payment is overdue. In addition we maintain a Right of Retention: The goods shall remain the property of Whitbourne Mugworks until payment has been received in full. If the goods are not paid for, we will arrange to collect them from the place they were supplied to. Of course this doesn't do us a lot of good as we are stuck with mugs we don't really want and the customer hasn't got the product they required. So we will still go to the small claims court to recover the value of the goods, plus our costs for reclaiming them. It's a long process, embarrassing for the customer as it may be reported in the media and just costs loads of money. But it is our last sanction. We hope to never have to go that far. If you provide artwork and it isn't right - that's down to you. If we send you artwork we have created for you to check (and where there are words, to proof read) and you approve it and later find an error - that is also down to you. Proof reading is ABSOLUTELY down to the customer. Plymouth Argyle Fixture Mugs for 2014-15 Season. A good example of where proof reading is absolutely essential !!! Colours are really difficult to perfectly match but we will produce whatever you send us by email attachment. But it has to be remembered that we are printing onto a shiny ceramic surface, so a colour that may show up as one shade on paper, a different shade as a cotton embroidery, may come through as a slightly different shade on a mug. The other element is that nearly everything we do is sent to us via an email and everybody has their screens set to their own personal preference - which in any case are only dots of light created by a computer, rather than a true colour spectrum. But ninety nine point nine percent of the time colours reproduce exactly as required - but Mugworks can not guarantee colours - so if colour is crucial to your job, ask for a sample to be made. There IS a cost involved but it is better safe than sorry. Copyright is complex civil law but in theory EVERYTHING we print is the copyright of the person who creates the design or image, takes the photograph or puts pen to paper. Even a signature is copyright to the person who makes the mark. Where we do the artwork, from drawing a design right through to the way we lay out images in a certain original way on the mug or other product, the copyright of that design or layout remains with ourselves ... though within that design there may be other images which are themselves copyright of someone else. For example a Club badge is the copyright of the Club - and in some cases the trademark - but the assumption is that if a Club or its official(s) commission us to use a badge then they either own the badge or have permission of the owner to do so. Similarly with photographs, drawings or designs (we produce product for many artists and photographers) ownership of the copyright for the image remains with the originator of that image and it is up to the person who commissions us to ensure that all copyright issues are settled before they make the commission. All liability thereafter remains with the person making the commission - not against ourselves. We are happy to print a copyright symbol on any product (and often do) to ensure that it is clear that a design is protected. On the subject of samples, it is not something we generally do, as most of our work are fairly short runs, often with a very quick turn around time required. But if you require a sample we nominally charge you as if we are making an individual mug (£9-75 on a standard mug) and post you the sample. 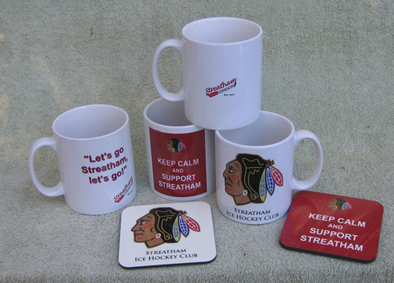 If you then go on to place an order of 36 mugs or more, we will normally then credit or write off the sample charge. Occasionally a mug may get broken in transit. If any broken mugs are found please inform us and we will replace the mug or mugs (normally by post) or credit your account. Occasionally also, mugs may get through our inspection process that are in some way flawed – either the structure of the mug itself or in the printing process. Once again, if you are not happy with the quality of a mug, please put it aside, let us know and we will replace it or credit your account . We are often asked if our mugs are dishwasher proof and microwave safe. Firstly, our processes do not contain any metallic coatings so can be used in the microwave without any problems. We can get that one out of the way in a single sentence. With regard dishwashing machines, the standard Durham* Rhino Coated Wycombe Mug as well as the occasionally supplied Orca Coated Mug are, in our opinion and experience, very good in a domestic dishwasher but are not dishwasher proof. But we have domestically dish washed many samples of our mugs over 100 times without problems. Our Porcelain mug (sometimes referred to as a "Sandhurst" style) is similarly Rhino Coated with the same properties. However, while the standard and porcelain mug is and always has been “dishwasher safe”, we have recently introduced a further option of guaranteed dishwasher proof Duraglaze mugs which are slightly more expensive. And within the Duraglaze range we can also offer “Two Tone” mugs with a coloured inner and handle with a choice of 12 colours in the range and also the delicate Bone China mug is now also a Duraglaze product. So, at the risk of being repetitive, lets be really clear about what is what. Our standard Durham Earthenware and Sandhurst Porcelain mugs are not offered as 100% dishwasher proof. We advise that dishwashing can eventually affect the print - particularly in hard water areas when there are often high salt levels in the dish washer. We are also aware that a mug can show signs of wear if constantly dish washed using particular detergents. And very hot commercial dish washers simply murder the print. We therefore cannot guarantee the pattern on these mugs and to maintain the vibrancy of the patterns, as part of our terms and conditions must recommend hand wash only, particularly when a mug is special to the customer. But our Duraglaze mugs, consisting of the normal standard shape in plain white, bone china and the two tone coloured mugs ARE guaranteed dishwasher proof. You pay a little extra and take your choice. It's horses for courses. The GDPR regulations introduced in May 2018 and the PECR (Privacy and Electronic Communications Regulations, which have been around for some time) are quite frankly a nightmare for all business and organisations. Designed by the EU to protect the individual from intrusive communications and illigitimate use of data, it has gone so far as to make your address book on your home computer technically in breach of the regulations. However, we endeavour to stay within the law and will only keep a record of our suppliers and customers email address in our address book and a customer file with designs and correspondence. There are some individuals, clubs, businesses or organisations who may not be a customer but with whom we have corresponded at some stage and we may keep a note of such correspondence. Occasionally we may use email addresses that have been advertised on a public forum, such as a web site, as the correct place of contact for correspondence in connection with the activity of that organisation, to contact the person at that address. This is known as a "legitimate interest" under the regulations. But we always offer that if a recipient of correspondence from ourselves would prefer that we do not communicate in future, that we will endeavour to avoid any further correspondence. The one exception may be if communications to a different email address is automatically transferred to another address which is then picked up by someone who has requested not to be contacted. There is little we can do in these circumstances other than to note the additional email address and add it to our "do not contact" list. Mugworks is a small sole trader SME and we do not share our contacts with anyone and have no linked businesses organisations. We have normal devise protection on our sole computer which is not linked into a network or with any other computers. New laws are in place that require us to tell you about Cookies. Cookies are then sent back to the originating website on each subsequent visit, or to another website that recognises that cookie. Cookies are useful because they allow a website to recognise a user's device. You can find more information about cookies at: http://www.allaboutcookies.org/ (opens in a new window). Alternatively, you may wish to visit http://www.aboutcookies.org/ (opens in a new window) which contains comprehensive information on how to do this on a wide variety of browsers. You will also find details on how to delete cookies from your computer as well as more general information about cookies. For information on how to do this on the browser of your mobile phone you will need to refer to your handset manual. This cookie is essential. The technology running most of the website (pages with filenames ending in .asp) sets a session marker to identify you whilst you are browsing our site. No personal information is stored. This cookie is deleted when you close your browser. This cookie is essential. The technology running most of the website (pages with filenames ending in .aspx) sets a session marker to identify you whilst you are browsing our site. No personal information is stored. This cookie is deleted when you close your browser.